Oh, people, I am so desperate for cold weather. This horrible in-between season keeps taunting me. It's nice and cool in the morning and I put on a short-sleeved sweater and pants. And then by about 11:30 I am incredibly hot and disgusting. I want to peel the layers off and walk around with no pants, but I can't because I'm a member of society. So I keep making these products that are fall themed so I can live vicariously through the adorable KPM Doodles clipart. The newest product is my Trick-Or-Treat! 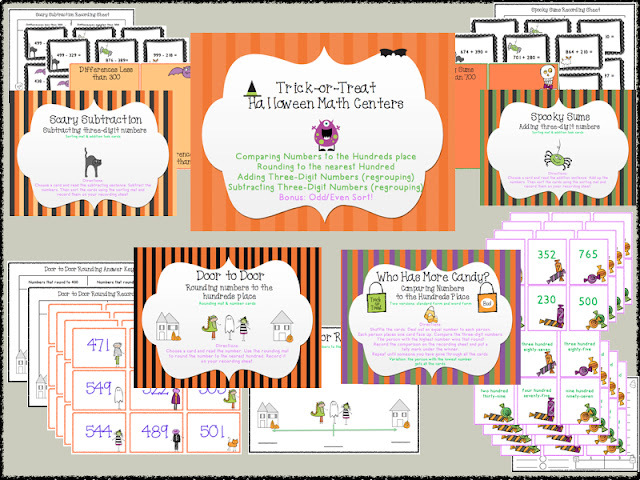 Halloween Math Centers. It includes a bonus freebie, which you can also get below. 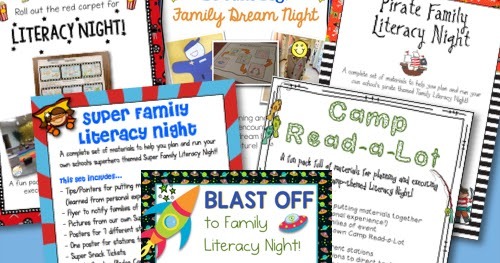 Check them out at TPT or Teacher's Notebook. 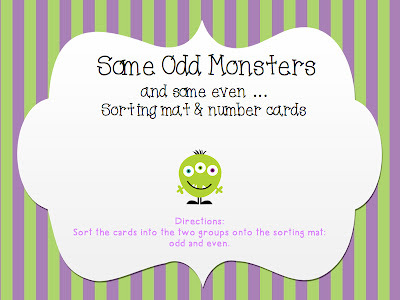 And grab your odd and even freebie at TPT or Teacher's Notebook! Couldn't help but make it. Look at this odd little guy. Today my heart did little happy smushes in my chest. This was because one of my teachers brought me a little tin full of tasty brownie muffin things and said, "This is just to say thank you from our grade level." I would have taken a picture, but I was too busy shoving tasty brownie muffin things in my face. Hence the happy little smushes in my heart. However, this did not exactly help me with the next problem: the problem of seeing myself on camera. I don't know anyone who likes to see themselves on camera. Oh, sure, there are some ego-manicas out there who maybe like to see what they look like + ten pounds, but most people I know spend a lot of time avoiding camera footage including themselves. doing a guided reading lesson with a group of kids. 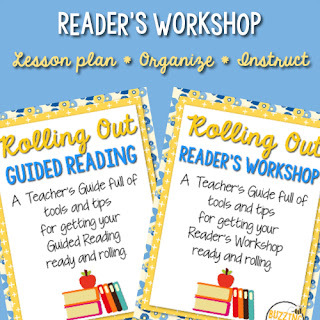 I'm giving a Guided Reading training on Friday, and I figure the best way to learn it is to see it happen with kids! In order to have the best video possible (the one in which I look the skinniest), I did a little pre-filming filming. Meaning, I took a video so I could figure out the best way to take a video. -when I say to point at something, point at it. -while I say something, wait until I'm done saying it to say what you want to say -when I say read, .......... wait for it ........... read. - Wearing sleeves. No one needs to see that. - Choosing a blouse more carefully so as to hide my side rolls. - Lowering my guided reading table. It's incredibly high for my short little torso. - Not looking down. It creates additional chins. - Learning how to speak without a lisp. Self-explanatory. - Being smarter. And last but not least, putting a sign on the door that says, "Recording in progress." Hopefully this will eliminate the voice-over from my K-2 buddy shouting, "Are you EVER gonna go to lunch?! Is this the SAME group as before?!" So I have my work cut out for me. I'll let you know how it goes. Poetree. or Poetry. Either way. So I have to train third - fifth grade on guided reading on Friday. This means I get to make a video of myself, giving a guided reading lesson. Video = ew. I'm not the most photogenic. I guess I'll share it with you when it's done and you can laugh, too. It's not exactly poetry in motion. And....segue. So, speaking about poetry, that's what our fourth grade teachers are working on. Anyway, our teachers have been working on explaining how the structures of poetry relate to their form, so I made these sample anchor charts so they could use them in their rooms. Then I took pictures of them for you. Awww, nice. 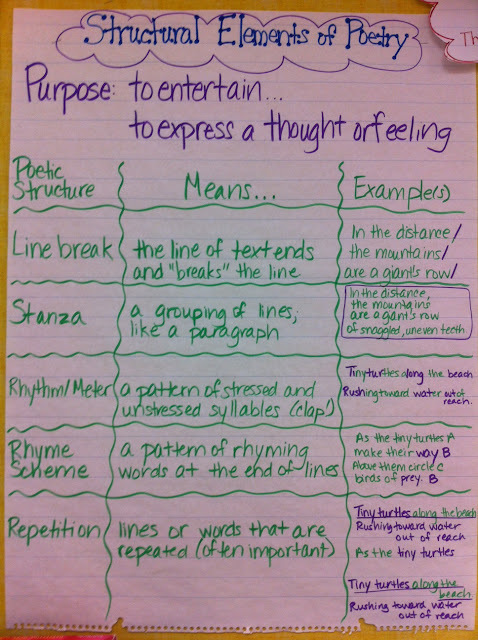 One of the things the teachers did is to glue the poem into the students' readers' notebooks. Then they took the poem and color-coded these structures in it. From there, they took one of the poems and cut it apart to glue into the "examples" section. 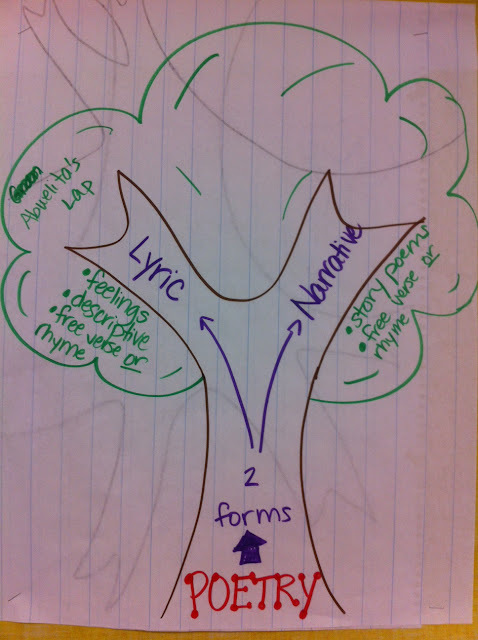 Do you like my poetree? lol I crack myself up. If you notice, there are some weird lines clearly from the back of the paper that criss-cross throughout the poetree. That's because I had to sketch it more than once to make it look right. Cut me some slack, ok? I'm sleepy. I am so sick of summer. I am tired of 100 degree days. It is September, and somebody should tell the weather that. On Friday, our school went to watch the parade. What parade? you ask. Our feeder pattern high school homecoming parade, which is always the first homecoming event of the district because this school is the oldest in the district; established 1927. This means it happens very early in the football season, aka the second week of school. The problem with attending a homecoming parade in a desert in early September, even if it is at 9:00 in the morning, is that it is hot. Incredibly hot. It was around 90 degrees and continued to climb. We stood on the side of the street and the children shouted for candy. "Candy! Candy!" they shouted at the passing cars. "Candy! Candy!" they shouted at the passing cheerleaders. "Candy! Candy!" they shouted at the passing horse. Some of the time, they actually got candy. That was an adventure in itself. The candy was tossed into the crowd of children. The children dove wildly and shoved the candy into their little ziploc bags. Then they continued shouting "candy" and sweating. After about an hour of this, one of the sticky, sweating kids told me, "I wish they would throw water instead." Me too, kid. Me, too. The rest of the day was pretty gross, mostly because I felt like there was a layer of dried sweat in between me and my clothing. Ew. The next day, though, a storm blew in and it has cooled off about 20 degrees or so. It is so much nicer. I can wear jeans without feeling like I'm going to pass out. It is lovely and beautiful and I just know it isn't going to last. 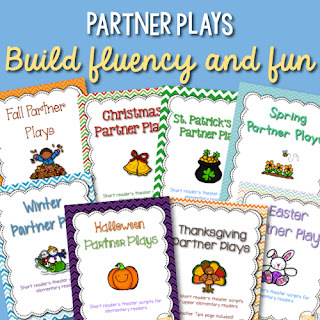 In honor of me pretending that fall has begun even though I know it hasn't, I am sharing my Fall Word Work Pack with you. I will happily email this to the first ten people to follow my facebook and comment here! The pack is appropriate for second and third grade. 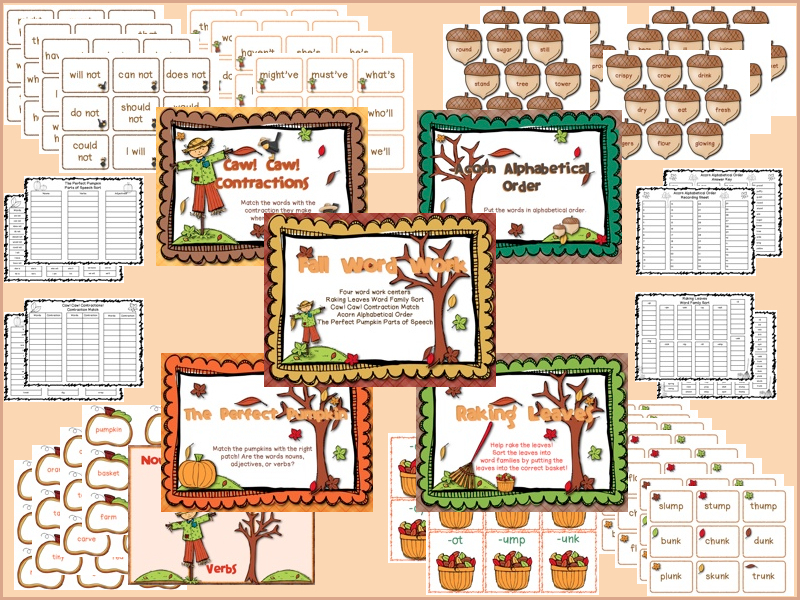 Includes contractions matching, word family sorting, alphabetical order, and parts of speech in a cute fall theme. 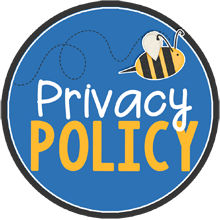 So first ten commenters, follow my facebook, include your email address, and I'll send you my fall word work pack! And if you miss it, you can grab it at TPT or TN. So, I wrote this post last Sunday....but this is the first time I have sat down since then, so I'm posting it today. I have just completed my first week of being a Schoolwide Project Coordinator. aka. 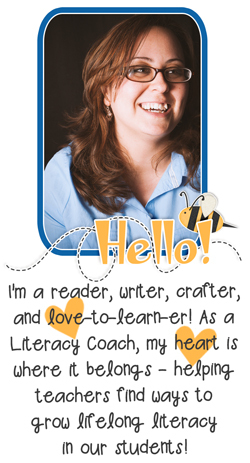 Literacy Leader. It was kind of cool. At first I was very, very lonely. My room was exceedingly quiet and I was a little depressed. I turned on my ipod dock and listened to some music as I worked to keep my ears busy. You know your ears are always busy in the classroom, and this was sad and silent. It helped a little. I had a lot to do, but I didn't feel very useful. In the classroom, there is always some little person in your face who needs you right now! But this was different. I was preparing things for much later and I felt not very helpful. But then teachers started to schedule meetings to plan with me and I set up a daily schedule for myself. I said things like, "Sure, I think I'm available on Wednesday at 1:45" and "I can put that together for you - no problem!" 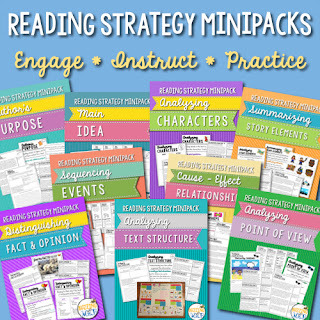 and "I have some sample anchor charts up in my room if you'd like to check them out," and I feel useful again. Tomorrow is my first official planning day with teachers. They have a modified schedule every Tuesday to allow for a 90-minute planning period instead of their usual 45-minute-scramble. And I'm the one who's supposed to help them plan! I'm excited and nervous at the same time. I hope I'm helpful enough. Because I've had a lot of my time wasted by people who intended to be helpful to us during planning....... but not so much. I'm trying to be very well prepared by breaking down our curriculum and having a planning document ready. I'll share those with you in the next couple days. More important than all my instructional preparation, though, is the candy. I think candy is a pretty essential component of a successful planning meeting. I mean, it doesn't always have to be candy. It can be a variety of other sweet or salty snacks, but in my opinion, the tastier, the better. I mean, people like candy, right? So I'll be like, "Here's some candy! See? I'm nice!" and I'll make through friends through the subtle art of coercion. I'm not above it. A while back, I saw this absolutely precious idea on pinterest and it has really stuck in my mind. TIP: Buy rollos that are in rolls. I went the cheap(er) way out and had to glue my rollos together first. About a third of the way through, I remember thinking, "Whose stupid idea was this?!" and I was not happy with whoever that was. I also considered just giving people tubes of glued-together rollos and kisses instead of making them into pencils, bt I thought that might be weird. I was proud and happy. P.S. - after the fact - they were a hit. People DO like candy. 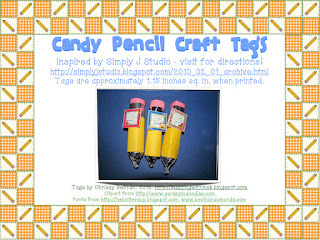 You can get the directions at Simply J Studio and then you'll be suckered just like me. Have fun gluing and making new friends. Grab the cute labels below if you're on a roll with some sweet people too.